The 17th year of Blues Bytes is in the books. 17 years? That's almost as old as the internet itself. As with every previous year, we use the January Pick Hit to feature the reviewers' Top Ten Lists for the past year. Here's my list of ten favorite CDs from 2013. Enjoy! Any band that consists of both Big Joe Maher and Anson Funderburgh just has to be good! Primer has always been one of the more underrated bluesmen on the Chicago scene, and this fine disc is just another example of why he's one of the best. Every Johnny Rawls CD is pretty much a guaranteed top ten, with this one having the added bonus of featuring songs from his musical mentor, O.V. Wright. This family band from Mississippi breathes new life into the blues scene with every new disc, and this one is their best yet. It was a brilliant idea to pair Ms. Hart with the native Australian Piper, with Split Second seldom leaving my CD player in the past year. I just saw this basic ensemble in concert recently, and of course it was one of the best shows of the show. Not surprising considering the array of talent here. Guitarist extraordinaire Anderson continues to produce quality music with every CD. Solid Chicago blues from four fine Windy City musicians. Veteran blues harmonica ace is joined by a host of special guests. An artist who has shown great improvement since the beginning of her career. "Walkin' Shoes" is one of the best songs of the year, and it really isn't even a Blues. Finis Tasby, Zac Harmon and Anson Funderburgh team up with James Goode's band to make an album too good to be left off the Top Ten (or Top Eleven!). 2013 was a fantastic year for new releases, and for me, it was really difficult to settle on just ten favorites, but here are mine. Johnny Rawls � Remembering O.V. (Catfood): The student pays tribute to the teacher. He learned his lessons well. David Egan � David Egan (Rhonda Sue): Egan is one of the best songwriters currently practicing, and nobody interprets his songs better than he does. Chris Antonik � Better For You: Outstanding sophomore release for this rising star. 4 Jacks � Deal With It (EllerSoul): One of several great recordings with Anson Funderburgh�s impeccable guitar work, this was one of the year�s most pleasant surprises. This is one of many great EllerSoul releases this year. Lurrie Bell � Blues In My Soul (Delmark): Bell does old-school Chicago blues, breathing new life into a well-chosen set of classic tunes. Smokin� Joe Kubek & Bnois King � Road Dog�s Life (Delta Groove): Another stellar set of roadhouse blues from this underrated duo. Toronzo Cannon � John the Conquer Root (Delmark): As exciting and dynamic a blues album as you will hear this year, and maybe next. 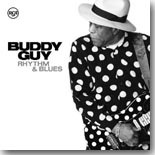 Buddy Guy � Rhythm & Blues (Silvertone/RCA): The Guy/Tom Hambridge collaboration continues to pay dividends for both, but their best may still be ahead of them. Frank Bey & the Anthony Paule Band � Soul for Your Blues (Blue Dot): A great singer finds a great band and magic ensues. Check out their live recording from earlier this year, too. Cyril Neville � Magic Honey (Ruf Records): Fellow Royal Southern Brothers Devon Allman and Mike Zito also recorded solo gems this year, but Neville�s release is hard to top with its blues/R&B/funk gumbo. This past year saw a lot of very good releases and a great deal of diversity which is great for this music genre we all know and appreciate. In no particular order, here is my top 10 for the year. A wonderful record by Otis who is the premier soul singer in our universe today. He told me last May at the BMA�s that his new record was going to be a good one and it is! Buddy continues to be Buddy and he�s at a point in his career where it�s great to see him have the flexibility to record projects such as this. Kudos to Tom Hambridge for continually bringing out the best in Buddy. A wonderful recording that shows Cotton is still at the top of his game blowing harp like nobody�s business. Outstanding record from Shaun that features some brilliant original songwriting from Bekka Bramlett. Caught my ear from the minute I pushed �play� and never let me go. A project Walter has long wanted to get off the ground and an amazing tribute to Luther Allison. Definitely got my blues/rock fix here! The record I always thought TUF was capable of and glad to see it make the light of day. Nick, Kris and Danielle show the future of the blues is in great hands! Brilliant record from the Cash Box Kings and a real treat for my CD player. Fantastic debut for this artist from North Carolina! A force to be reckoned with, Nikki Hill�s star is fast rising and far reaching. Wonderfully mature record from my friend in the Bluff City. This disc definitely shows that the faith we all had in Brandon in the early years was truly justified! Final record from this soul blues legend. Shows his artistry and mastery of his craft. A fitting legacy for Lou. Honorable Mention: Dave Keller � Soul Changes. Kevin Selfe � Long Walk Home. Cassie McKenzie Taylor � Out of My Mind. Hadden Sayers � Rolling Soul. Kara Grainger � Shiver and Sigh. All contents Copyright � 2014 Blue Night Productions. All rights reserved.